It is no oil/butter toast, made in brown bread, with goodness of suji, richness of curd and veggies (all of your choice). I topped the toast with some grated cheese which you can skip. But the crisp brown color of the grilling comes with cheese. Mix Suji and curd and keep aside for 30 mins to get the spread fluffy. You can adjust the consistency of the spread as per your desire. Add the chopped onion, tomatoes, chilies, boiled corn and salt. Apply a thin layer of this spread on a bread slice. Garnish with coriander leaves and top with some grated cheese. Grill 3 slices in microwave oven for 4-5 mins. You can roast the toast on a hot griddle too for 5 mins on the lower side and then 2 mins from the topping side. Keep the flame low while roasting the topping side to avoid the toppings from burning. You can add the toppings of your choice and adjust the time to grill. Keep the layer thin so that the inner part is cooked properly. 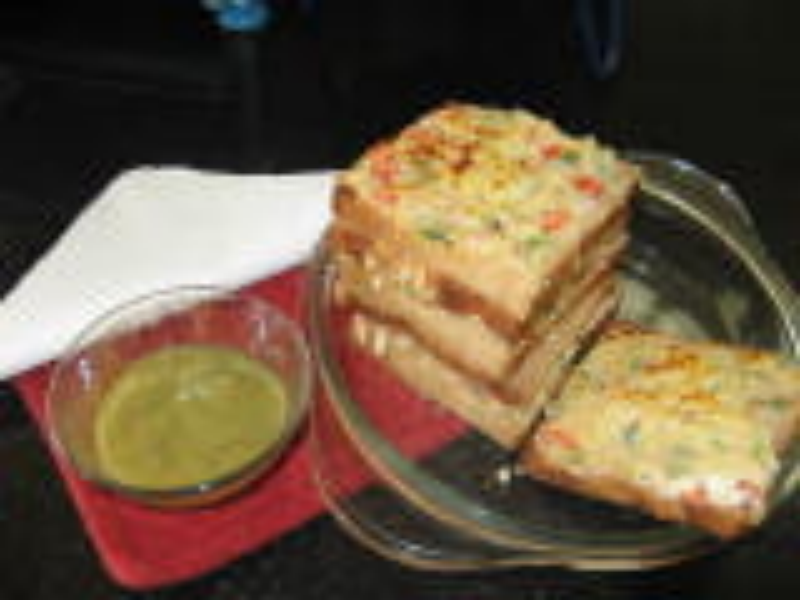 Green chilies would bring in the hotness to this toast if thrown in the spread. Some black pepper would also be good to add.